A graceful conifer, Juniperus x pfitzeriana Carbery Gold forms a low, spreading mound of attractive, creamy-golden foliage which holds its colour year round, providing a lasting feature in your garden. Juniper Carbery Gold will grow to just 1.2 x 1.2 metres in 20 years and takes well to pruning should you wish to limit its width. 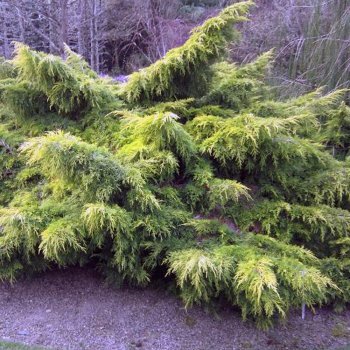 This golden conifer is suited to all soil types, thriving in moist, well-drained sites and can tolerate shade. Our pot grown Juniperus Carberry Gold trees can be planted at any time of year. Firstly, remove weeds and grass within a metre of your desired planting hole, then dig a square hole as deep as your root mass and approximately 2x as wide. To help Junipers establish more effectively, sprinkle Mycorrhizal root grow into the hole. If you’re planting Juniper in spring, summer or dry weather, water well and regularly for the first few months. Keep an eye on young trees and increase watering if there are extended periods of hot or dry weather. If you’re planting in autumn, you may only need to water your tree a little. We stock a range of irrigation kits to aid watering. Once planted, Keep the area free of competing weeds and grass for the first couple of growing seasons. Using a glyphosate based weed killer or installing mulch matting and bark chips will aid in this. Do not simply mow the grass around the area as this will only encourage it to grow more vigorously. Carberry Gold Juniper trees do not require a lot of pruning. Simply remove any dead, diseased or awkwardly placed branches from your conifer as and when you see them.